1. Preheat the oven to 200 ̊c, gas mark 6. roughly chop the nuts; scatter on a large, parchment-lined baking tray. Roast for 3-5 minutes, then stir through the honey and sea salt. Roast for a further 3-5 minutes until golden; cool. 2. Lower the oven temperature to 180 ̊c, gas mark 4. Line a 20cm x 20cm square cake tin with parchment. Melt the butter and 200g chocolate over a low heat; stir gently until combined. Take off the heat. 3. Whisk in the sugar, salt and vanilla, then slowly whisk in the eggs, then flour, until smooth. Stir in 75g of the nuts. Tip into the tin; bake for 30-35 minutes. Cool in the tin. 4. Meanwhile, blitz the remaining nuts in a food processor until smooth. This may take a while, but leave the motor running and it will turn into a smooth nut butter. 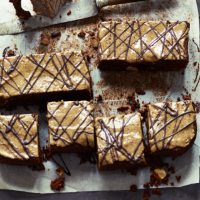 Take the brownies out of the tin and spread the nut butter over the top. Chill for 10 minutes. 5. Put the remaining chocolate in a small resealable freezer bag. Put in a bowl and cover with boiling water for 10 minutes; cool for 5 minutes. Snip a small corner off the bag; drizzle the chocolate over the brownies. Leave to set, then slice.